TONIGHT’S GAME: The Stampede host Sioux City in Game 2 of their first-round best-of-three series. The Stampede took the first game last night by a score of 2-1. LAST NIGHT: Andre Lee’s power play goal with 6:59 remaining in regulation proved to be the game winner as the Stampede held off the Musketeers in the first game of the series, 2-1. Jared Westcott gave the Herd a 1-0 lead in the first period when he one-timed a pass from Ryan Sullivan into the net. The Musketeers responded with a goal at 8:03 when Blake Biondi scored. It remained tied until late in the third when the Stampede went on a 5-on-3 advantage and Lee tipped in a pass from Max Crozier into the net for a 2-1 lead. The Herd limited the Musketeers to just one shot in the third period to secure the win. Jaxson Stauber stopped 12 of 13 shots to earn his first career USHL playoff win. STAMPEDE UPDATE: The Stampede closed out the regular season last Saturday with a 7-0 thumping of the Des Moines Buccaneers. Jaxson Stauber stopped all 16 shots faced for his first career USHL shutout. Sioux Falls finished the regular season with 39 wins, fourth all-time in franchise history. Their 85 points were third most by any Stampede team and their 23 home wins were the most by any team in the PREMEIR Center and second all-time. The Stampede entered the playoffs having won five of their last six games and going 7-3-0 over their last 10 games. The Herd went 3-6-0 during the month of November, but finished the season going 31-9-5, one of the best records in all of the USHL. The Stampede were led in the regular season by Artem Ivanyuzhenkov who tallied 50 points (26g, 24a) in 59 games. The Russian forward has 50 goals in his two seasons in Sioux Falls putting him in the top 10 all-time of Stampede goal scorers. Anthony Romano was second with 47 points while Cade Borchardt had 46 points on the season. The Herd’s depth carried them during the regular season with 15 players who posted 20 or more points on the year. In goal, Jaxson Stauber won back-to-back starts to close out the regular season and went 3-1-0 with a 1.39 GAA and a .925 save percentage over his last four starts of the season. MUSKETEERS UPDATE: The Musketeers were sitting out of the playoff race after losing 5-1 at Tri-City on March 9th. Sioux City got healthy though and went 8-2-0 over their next 10 games to pull past Omaha and secure the sixth and final seed. The Musketeers are coming off back-to-back losses to close out the regular season, but neither of those games matter in the standings for Sioux City who had already secured the number six seed by then. The Musketeers have some big weapons offensively. Bobby Brink was one of the best forwards in the league all season and finished fourth in the league in scoring with 68 points (35g, 33a) while Martin Pospisil posted 63 points (16g, 47a) in just 44 games during the season. They are also home to one of the defensemen in the league in Luke Johnson who has posted 26 points (3g, 23a) in 38 games. In goal, Ben Kraws has led the way going 24-16-6 with a 2.92 GAA and a .895 save percentage. UP NEXT: Should Sioux City win tonight, Game 3 of the series will take place at the PREMIER Center Thursday night. Tickets will go on sale immediately following the game tonight. Should the Stampede win, they will travel to Waterloo for Games 1 and 2 of the Western Conference semi-finals before returning home for Game 3 next Tuesday night. For more information visit sfstampede.com. 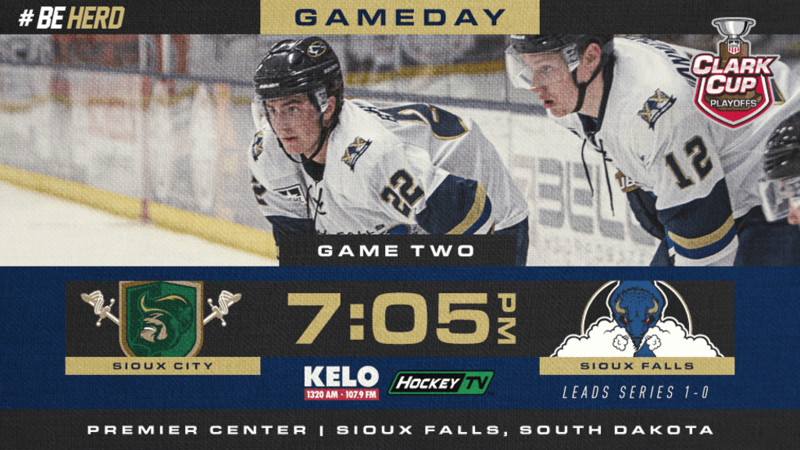 Stampede open playoff series with Sioux City tonight!